"Rookies are always ecstatic, seasoned players are quieter. Both on and off of the battlefield, winning is the only absolution." "Like life, basketball is messy and unpredictable. It has its way with you no matter how hard you try and control it. The trick is to experience each moment with a clear mind and an open heart. When you do that, the game - and life - will take care of itself." Jackson explains that faith and religion never resonated within him until he was introduced to Buddhism. Like many of us, Jackson expresses that in order for him [humankind] to fully place his belief in anything, he needs to both feel and relate to the virtues which define the governing belief being presented to him. He elaborates by explaining that not until he began regular meditation, which Zen Buddhism is based solely upon, was he able to find its tangibility, truth and divinity. 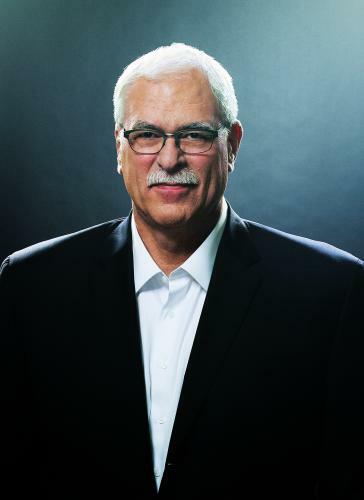 He presents three lessons, which were passed on to him by Red Holzman, coach of the New York Knicks during Jackson’s freshman year as an NBA player. The following lessons are not fastidiously focused on Eastern philosophy yet provided Jackson with the ability to tie his newly found spiritual awareness to nearly any universal event. (1) Don’t let anger or heavy objects cloud the mind. Jackson eloquently asks the audience to simply listen to him apply the tenets and theories of Buddhism to the tenets and theories of the practice of everyday life. "After placing individuals in positions that fully realize their potential, a leader secures harmony among them by giving them all of the credit for their distinctive achievements." Jackson explains that there are three approaches to managing, or in his case, coaching. He explains that the only way to become an honorable and unbiased leader is to identify the types of leaders each of us naturally are. He identifies the three styles of managers: as Control-aholics, who micro-manage everything from the players to their shadows (and what they are not doing , on and off the court.) Then he refers to Laissez-Faire Leadership (which, translated from French, means “hands off.”) Jackson also refers to this as , “non-leadership.” Jackson considers himself to be be a “MiddleRoader.” He characterizes this type of management as “perfect.” He attributes his ability to remain even-keel, to leave the game on the court and the drama at home, to his practice of Zen Buddhism. He characteristic of this type of management as perfectly, even-keel and attributes his ability to leave the game on the court and the drama at home, to his practice of Zen Buddhism. As “MiddleRoader,” he goes on to say that by making a regular and conscious effort to remain neutral and act without ego, man is best able to oversee and advise others. The answer, according to Jackson, is to see beyond what is seen. Never forget that a wheel is not only made up of spokes but also the space between the spokes. Sturdy spokes, poorly placed, make a weak wheel. Full potential can only be reached when harmony between the spokes is achieved and it is the job of the craftsman [manager] to create and balance those exact spaces. "I learned to trust the moment, to immerse myself as mindfully as possible, so I could start to react spontaneously to whatever was taking place." Human beings are curious creatures by nature. With unbridled curiosity, there is commonly a great deal of mental energy expended for us to try to become something more than we are capable of being. Jackson maintains that the use of vigilant mindfulness and fully immersing ourselves into our actions, can allow us to control the outcome. Remaining realistic and humble are the simplest paths to success. Given the competition and push to always be a better version of who we are, this is a reminder to not focus on where we may never get but think about from where we came. Describing Sacred Hoops as a book about basketball would be wildly inaccurate. What it is, however, is an account of one man’s ability to draw from what he is knowledgeable and passionate about and apply his knowledge through faith to any situation. It is a series of anecdotal and relevant ideas elemental not just to the foundation of the practice of Zen Buddhism, but to life. It is a blend of perfectly dosed amounts of faith, experience and results. Garnished, with a many rebounds and a few assists, Jackson delivers a slam dunk. I asked myself prior to reading Sacred Hoops if I would remain interested long enough to read it in its entirety. Given my underwhelming excitement for the sport of basketball, I was not sure. Retrospectively, as I close the back cover for the fifth time, I realize as I have upon finishing it in the past, that I remain more interested than ever before.